WCantemo Portal is the only solution which allows the easy migration from Final Cut Server while preserving the existing PresSTORE Archive by Archiware without the need to restore media during migration. The German concept of heimat reflects a unique relationship between community, shared heritage and a profound sense of belonging. It is in keeping with this spirit of connection that the new content Media Group GmbH (nc media), a subsidiary of one of the largest German energy providers, EWE, broadcasts local stories to audiences across the north-west of Germany. From the base in Bremen, the eponymous web channel, heimatLIVE, delivers a wide range of programming gathered from sources within the region and all focused on the varied lives of its citizens. To successfully manage production on this scale the heimatLIVE designed a sophisticated workflow, which encompasses the entire process from ingest, through publishing, to archive. Until recently the process was constructed around four Final Cut Server systems. The core functionality is augmented by custom tools to interface with news agencies for content acquisition and Archiware P5 for deep storage on LTO. When the decision was made to replace Final Cut Server, the nc media team determined their need was for a modern media asset management solution that would take the station forward. They wanted to consolidate resources and for the new tool to add support for modern codecs, the latest NLEs and next generation of post-production workflows. The demands of the heimatLIVE broadcast schedule also required the transition happen without any downtime. After careful assessment of these factors the team selected Cantemo Portal™ as the clear choice to manage production and publishing workflows. Portal is designed to be open and extensible. Each component can be modified and augmented to suit specific requirements. As the developer of the CP Migration Tool and the CP Archive App, Cologne based moosystems was uniquely placed to both provide the apparatus and facilitate the transition from Final Cut Server to Portal. CP Migration Tool provided the path to transfer and consolidate all of the data from the multiple legacy systems into a single instance of Portal. This process first involved exporting and converting the metadata from Final Cut Server, then mapping the storage and importing everything into Portal. The CP Archive App provides direct integration with Archiware P5 Archive. This enabled Portal to utilise the existing LTO archives and pick-up exactly where Final Cut Server left off. Today, Portal is able to retrieve previously archived data and automate the transfer of new media to the archive. For end users the management of different storage tiers is transparent. The integration of the CP Archive App means Portal is able to manage where data resides and restore master files as required. That the migration and integration of services was achieved without any downtime, or interruption to programming, is testament to the flexibility and overall robustness of the integrated Portal solution. It is a major accomplishment to manage so many moving parts and co-ordinate the smooth transition of an established asset management system. The success of the project is the result of a combined effort, which also reflects on the resourcefulness, commitment and collaborative nature of the teams. We used four Final Cut Server systems with a central Archiware PresSTORE Archive and several customized tools to handle our approval, publishing and archiving workflows. Cantemo Portal allowed us to migrate all existing data without any downtime and without the need to restore data from tape. Now we have a single central MAM solution providing us with more effective and highly integrated workflows. Though the four Final Cut Server systems had proven to be reliable workhorses for heimatLIVE, there was a consensus that the solution was showing its age. The need to restructure and modernise, as well as the centralisation of human resources, provided the impetus to create new, more efficient workflows with Portal. The need to provide a solid review and approval process remained paramount. There also needed to be a method of publishing “content packages” to the web. Portal currently manages about 19,000 individual items and each day, ten new shows are introduced to the system. 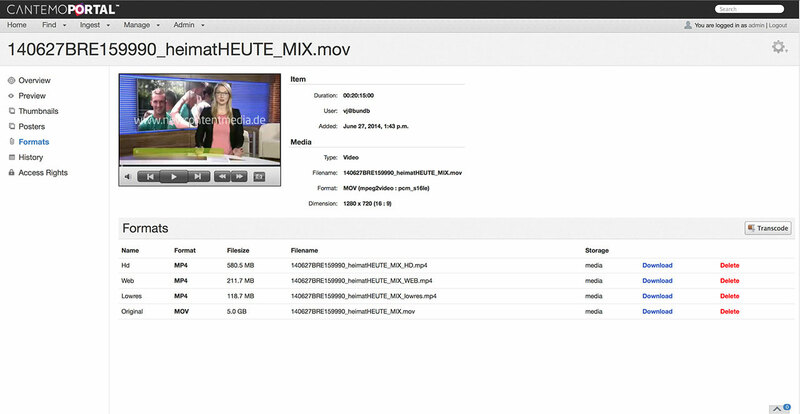 Today the heimatLIVE team manage the first stages of production using an external system, based on Filemaker. When the editor is ready they can upload media to Portal to initiate the review and approval process. Each user on system uses a smart folder to find media on which they need to work, so it is very easy to identify new content. Once a reviewer has a file they can set the approval status and use the Annotation Tool to add comments to specific sections of a clip. If a file is returned for additional work the assigned editor is notified and able to make adjustments before resubmitting the project and triggering a secondary review process. Approved items are automatically delivered to a master editor. It is the master editor’s job to select an appropriate poster frame and publish the package to the web TV platform. The process of publishing a file is entirely automated by Portal. 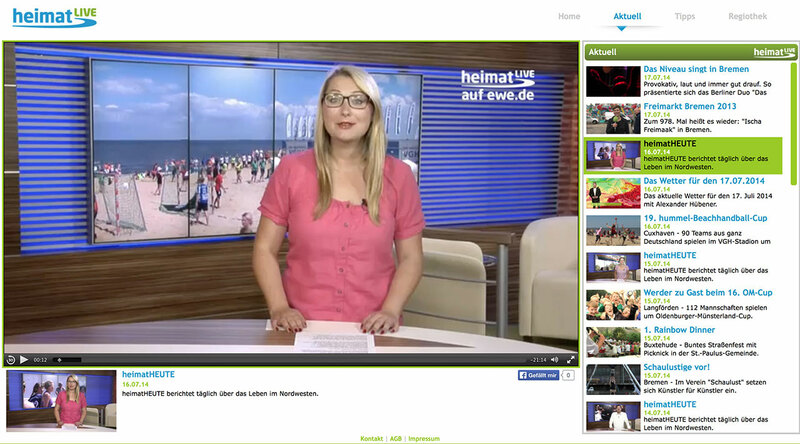 The heimatLIVE logo is added to the clip and media transcoded to two different resolutions. 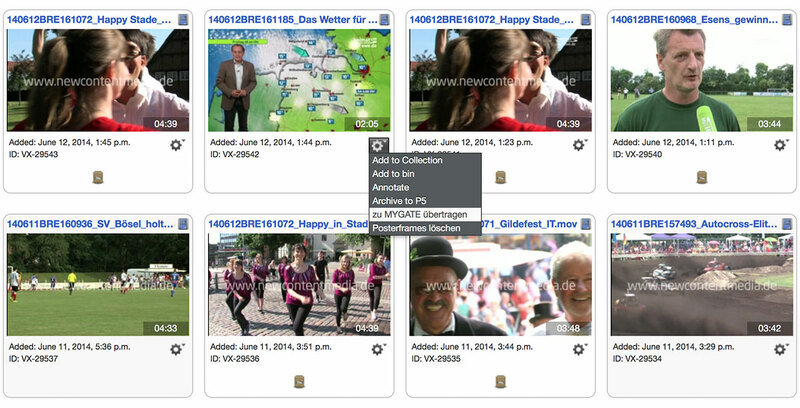 Metadata is imported via XML and converted to be compatible with the web TV platform. Once the package is complete the poster frame, XML file and media content is wrapped in a “tar ball” and transferred to the web. Cantemo Portal is a very open MAM system which allows for comprehensive customization. This was essential for the customer, as the whole publishing workflow needed to be integrated into Portal’s user interface, as well as into its backend. The integrated transcoder generates web TV formats (including logo overlays) which can be viewed on all kinds of devices like Android, iOS, OS X, Windows and Linux Desktop systems. In both workflows the complexities of the process are largely invisible to the creative teams. The flexibility of the Portal interface and intuitive nature of the supporting applications means that editors and reviewers can focus on editorial tasks, rather than technical operations. The new tools are easy to learn and empower end users. All of this means that workflows can evolve without difficulty and are easier to handle by everyone concerned. When the job is to produce shows focused on community and shared experience there is a certain poignancy to the idea that Portal enables this relationship to extend into the post-production process. Seeing once more that Archiware’s Archive software is chosen in a challenging and cutting edge workflow shows its ability and versatility. We are constantly working to make it even more flexible and support more workflows. Our partners like moosystems help us with their specific and far reaching insights and experience.” Dr. Marc Batschkus, Business Development Manager at Archiware. moosystems provides comprehensive consulting services regarding Media Asset Management and workflow optimisation and develops both standardised and custom tools in the Cantemo Portal ecosystem. With clients situated around the world moosystems is well placed to help each organisation find the right tools to streamline different workflows. The approach is to keep it as simple as possible and consider budget, existing technology as well as human resources.